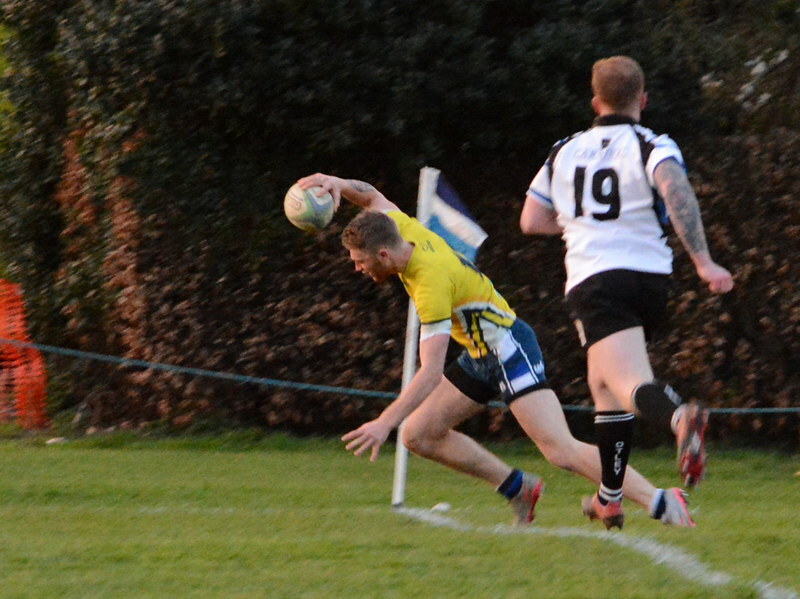 Cup-ties are for winners only and ‘Ensians had their mindset in good order as they welcomed Otley Saracens to Chaffers Field for Round 2 of the Aire-Wharfe Cup. The home side chose to have the strong breeze at their backs and with the visitors’ kick off failing to make 10 metres, there was an immediate tactical aspect to the game. Otley looked dangerous ball in hand and their big pack suggested that they might prevail as the game wore on, but ‘Ensians were in no mood to go backwards. Their eagerness and adrenalin, however, caused problems and penalties were incurred all too frequently. Tackling from both teams was tight, but ball was spilled and turnovers achieved, resulting after 10 minutes in Ollie Eaves putting Alex Murphy away for a try wide out. A good conversion by Connor Bateman was a great start for the home team and Murphy was soon involved again with a strong run. Otley won a turnover and counter attacked, Rob Lofthouse “scragged” their no. 8, no. 9 knocked on and the action was fast and frenetic. ‘Ensians scrum was holding its own, defensive work was first-rate and Sam Featherstone was prominent in the line out, but penalties to Otley were evidence of ill discipline in the ruck & maul areas. Otley were successful with a penalty and reduced the arrears, but the home side soon cancelled that out with a fine 3 points from Bateman’s boot. 10-3 after half an hour. The strength of the downfield breeze was evidenced when a lovely kick from Will Cooper went dead and play was restarted on ‘Ensians 22. More infringements led to skipper Featherstone receiving a referee’s lecture and a yellow card reduced the home team to 14 men. The 10 minutes before half time were crucial for both teams with possession, territory and mistakes being shared. Eventually, Otley had enough ball, tap-&-go chances and the ‘Ensians wall broke. A try by the posts and an easy conversion brought the scores level at 10-10. Half time at ten past seven, the breeze had calmed as predicted by our local forecaster and a short turnaround was a sensible decision. ‘Ensians restarted, but were straight back for a scrum on the centre spot. This was a good game, with both sides producing attractive football. Jack Smith was breaking the gain line, but Otley regained possession and were going through the phases. Infringements were all too frequent though and there were opportunities for both out-of-hand kickers to make good distances. The breeze was certainly not the force of the first half and Will Cooper was able to kick ‘Ensians out of trouble. Otley were yellowed and the referee showed tolerance and consistency in his decision-making. Featherstone was really dominating the line out and clean off-the-top ball provided the home side with running/handling opportunities. Lee O’Donnell had a strong run, ‘Ensians put Otley under a lot of pressure and were rewarded when Bateman converted a penalty to give his team a little nudge forward. 13-10 at 7.30 and if light was certainly not a problem, infringements kept the referee busy and the game continued at a rare old pace. ‘Ensian forwards were standing up well and indeed out shoved the Otley pack on one occasion. Otley were lectured but the card stayed in the pocket this time. Murphy was prominent on the crash ball, but the visitors held firm and made some saving turnovers. Bateman made ground with a strong run on the left, a Featherstone line out ball preceded a driving maul (one of very few actually) and Otley were shown the yellow for persistent offending. Cooper kicked well from penalties to keep Otley pinned in their 22, but Otley’s defence was resolute and a lengthy delay over replacement front row issue gave everyone breathing time. An uncontested scrum went wrong for Otley, ‘Ensians had quick ball and Cooper, with a long mis-pass, sent Bateman on a thrilling run to the corner.The conversion was a great effort but just failed and a board of 18-10 meant that the visitors need to “chase the game”. Two kickable penalties were missed and with them the chance to go for a winning score. Featherstone won yet another line out, the ball was kicked to touch. Game over; a terrific contest; all credit to both sides; ‘Ensians’ mindset prevailed; a deserved win over a strong Saracens team. The winners take the night!